We have all said that at some point in our lives. Most of us have done it many times. It is one of those things we don’t even think about—we just say it robotically. It’s instinctive because deep down at some subconscious level, we know it is the right thing to do. Can you imagine what would happen to a centipede if someone asked, “What do you do after your 13th leg hits the ground?” Asking for time to sleep on an issue is like that centipede walking. We don’t have to stop to contemplate what we are saying. We just say it. And that is a good thing. I’d hate to imagine the human version of that centipede lying in a crashed and crumbled heap trying to figure out what he was supposed to do after the 13th leg. Lexington is a tiny town, just over one square mile in size with fewer than 1,300 residents. 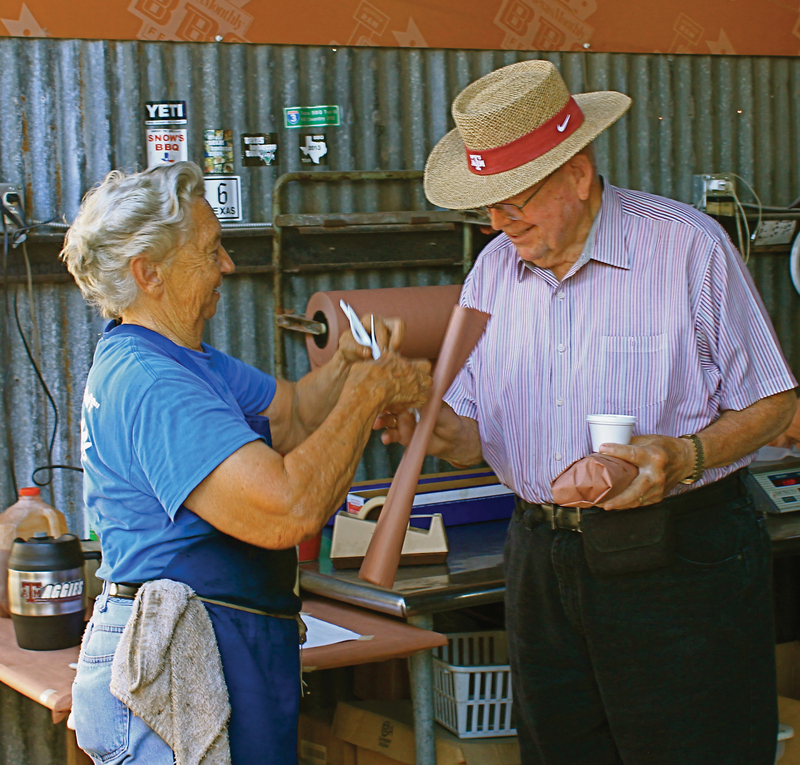 Every Saturday, farmers from around the area come to town for a cattle auction that starts just past noon. But long before that, they go to breakfast—at Snow’s Barbecue. Over the years, I have made it a point to try all of the best barbecue joints in Texas. I guess you could say I am an aficionado. My wife thinks I’m more of an addict. It’s a matter of perspective, I guess. I keep track of the rankings published by the “experts” (people who are supposed to know more about this than I) just in case a new upstart place breaks into the elite level. I had tried all the rest of the top ten places in Texas, but because of the difficulty in scheduling, this one remained. Texas Monthly said it was the best brisket in Texas. 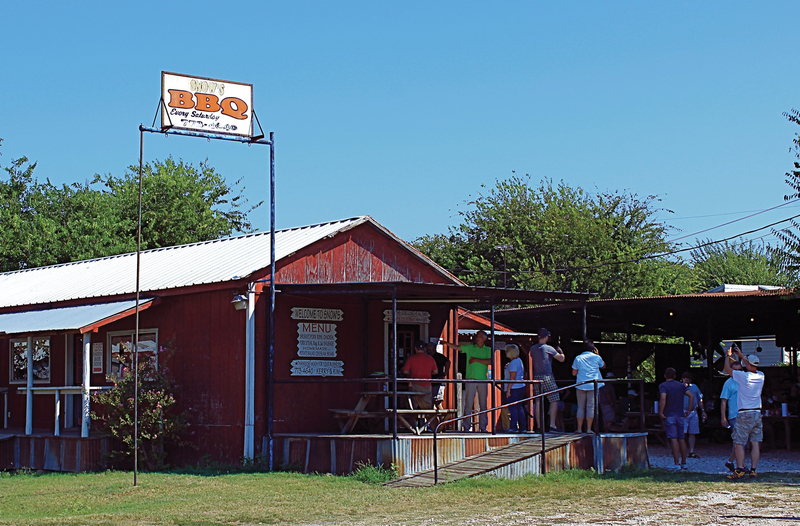 The New Yorker topped even that, calling it the best barbecue in the world. But to get some, you have to go on a Saturday and get there early. Snow’s opens at 8 a.m. on Saturdays only. They close when they run out of meat, generally well before noon, but the brisket runs out long before that. Be prepared to wait in line. I was in line less than a half hour when I got my plate full of brisket. I grabbed a couple of cups of the free beans and the usual “fixins” — pickles, jalapenos and onions. Then I sat down and dug into the most heavenly brisket I have ever experienced. After savoring the first bite, I tried the second with a dollop of the fabled sauce they make. It was sacrilegious! The best sauce in the world would only serve to lower the quality of this piece of perfection. I never touched the sauce again. The meat was magical. I couldn’t call this a religious experience. It was more than that. As I drove through Hill Country later that day, I kept thinking about my morning and the experience I had at breakfast. I’ve been to all the barbecue places in Lockhart and Luling, several in east Texas, many in West Texas, some around Abilene and even Cooper’s in Llano. Never have I had an experience like this. Was Tootsie’s brisket really that far beyond everything else I’ve tried? Or was there something else at work here? I don’t claim to be the first to discover this principle. Ernest Hemingway’s most recent posthumously published book (July 2000) is titled True At First Light. What might be different in my way of looking at it is that I see this as more than just a simple truth—it is, in fact, a metaphor for something much larger. Seeing the truth, and seeing it clearly, sometimes requires more than just a fresh day at first light. Sometimes it needs a fresh start altogether, a whole new beginning. Most of the positive major events in our lives are preceded or accompanied by new beginnings. We change jobs, partners, geographic location or maybe our way of looking at the world. These new beginnings allow us to see the world more clearly, to operate with heightened senses that allow us to take in and process more information — more of the detail that has always been available to us but that we were unable to access because we were in old patterns, using old ways of thinking. The new beginnings allow us to see truths that were previously hidden from us by the hazy light of mid-day. Only in the early morning light — of day, and of life — can we see the world without its shadows. Truth requires new beginnings. Perhaps Ms. Tootsie’s brisket isn’t really that much better than all of the other outstanding barbecue places I have visited over the years. Maybe instead, she has hit on a universal truth and learned how to capitalize on it. Like our minds, our physical senses are at their peak in the early mornings. Our senses of sight, smell and most important, taste, are working at their absolute best. That creates a golden opportunity. So I took a night to sleep on it. The next morning I decided maybe her real secret is brisket for breakfast. Brisket for breakfast–what a great idea. Yummy! Michael, your depth of thought scares me because it makes me realize how shallow my thinking and appreciation is. I really enjoy travelling along with you. By the way, try “Florida’s” out of Livingston. It is a black café that I bet is equally as good as your discovery. You evidently are better from your septsis bout. Hi, Jill. Mary Ann died on Oct. 17. Will explain later.